Gives your Digestion a Boost! Boosts Immunity : A body's health depends on your immunity to fight infections and hence diseases. In return, the immunity is determined by the population of good bacteria in the gut. Stress, long working hours, lack of adequate sleep, irregular food habits is part of the current lifestyle factors creating a perfect imbalance of good and bad bacteria in the digestive system giving rise to problems of diarrhoea or constipation. WonderPro provides for the right number of good bacteria for a healthy digestive system & immunity. Improves Digestion :WonderPro extracts the right nutrition from the intake of food you consume and provides for a balance despite disturbed lifestyle habits. Stimulates Vitamin B : Vitamin B12 keeps the nervous and blood circulatory systems healthy keeping critical body processes running. Helps Body Metabolism : The metabolism governs the body's fatigues & how you feel. 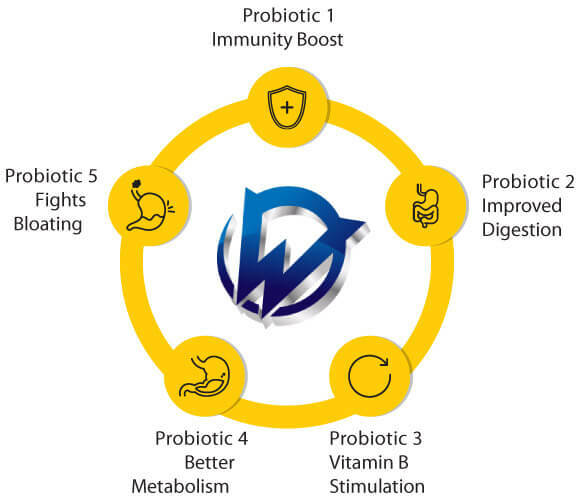 WonderPro provides for the right probiotics which maintains the balance of bacteria thereby helping faster metabolism. Fights Bloating : Caused by imbalance of good and bad bacteria, the super action of WonderPro fights bloating and cleanses the gut of unwanted micro-organisms. Ingredients & What Is WonderPro Made Of? A healthy human gut contains billions of bacteria. Some of these are good bacteria and others harmful for human body. Modern lifestyle coupled with unbalanced diet leads to an imbalance in the intestines, thus reducing the amount of good bacteria in body. Probiotic, meaning “for life”, are food supplements that contain Good Bacteria, which when taken regularly can help maintain a healthy balance of good bacteria. PROBIOTIC SUPPLEMENTS HELP INCREASE THE POPULATION OF GOOD BACTERIA IN THE GUT. STUDIES HAVE SHOWN THE GOOD BACTERIA HAS A LOT OF ADVANTAGES.